Makeup is Delicious!! : FOTD: Simplicity! Hey everyone!! This is my super simple face of the day, which I have been wearing all month and will continue to wear until I'm done exams. I'm a little stressed and couldn't be bothered to go into more detail in the morning. I just want to get to campus as fast as possible! ﻿This look is only seven quick steps: brows, eyeshadow, mascara, concealer, foundation, powder, blush and go!! I started by filling my brows with a brown eyeshadow and brushing it through them. 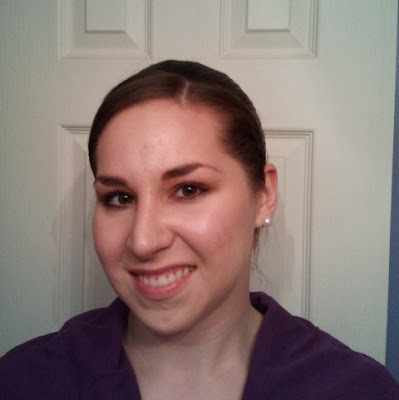 Then I applied a white highlight under my brow, and a brown eyeshadow all over my lid and crease. I blended where the two colors met and that's it! Next, I swipped two coats of mascara on my top lashes, and one coat on the bottom. I followed by applying concealer under my eyes and on any blemishes, then applied a thin layer of foundation all over my face and my neck. Finally I applied powder to set my foundation and a quick swipe of blush. 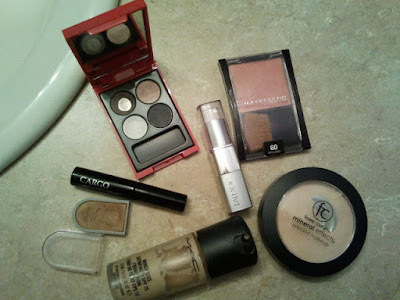 Starting from bottom left and moving clockwise: Mary Kay eyeshadow in "Lucky Penny", Cargo Lash Activator mascara in "Black", Elizabeth Arden The Red Door eyeshadow quad using the colors "Smoke" (top left) and "Moonbeam" (bottom left), Palladio concealer stick in "Ivory", Maybelline Expert Wear blush in "Berry Sorbet", Femme Couture Mineral Effects pressed makeup in "Fairly Light" and Mac Mineralize Satin Finish foundation in "NW20". 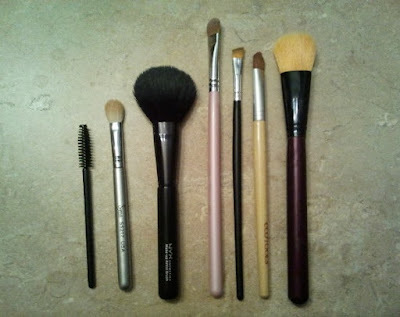 Brushes from left to right: brow brush from Sally Beauty, Sigma SS217 blending brush, NYX powder brush, Sigma SS252 flat shadow brush, Coastal Scents angle brush, Eco Tools flat shadow brush, and Coastal Scents foundation brush.